The death of a loved one often brings feelings of despair and isolation, but a new exhibition and anthology of poems offers comfort through shared experiences. "The Art of Losing" exhibition opens March 15 at Emory University's Manuscript, Archives, and Rare Book Library (MARBL), on the 10th floor of the Woodruff Library. 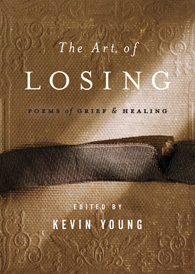 The exhibition coincides with the March 16 release of "The Art of Losing: Poems of Grief & Healing," an anthology of elegies selected by poet Kevin Young, co-curator of the exhibition. Young is the curator of Literary Collections and the Raymond Danowski Poetry Library at MARBL, and the Atticus Haygood Professor of English and Creative Writing at Emory. The book includes poems by Elizabeth Alexander, Pulitzer Prize-winner Natasha Trethewey (the Phillis Wheatley Distinguished Chair in Poetry in Emory's Creative Writing program), Elizabeth Bishop, Lucille Clifton, e.e. cummings, Emily Dickinson, Seamus Heaney, Ted Hughes, Mary Oliver, Anne Sexton and Dylan Thomas, as well as several by Young himself. Also included are poems by recent readers in MARBL's Danowski Poetry Reading Series: Robert Pinsky, C.K. Williams and Li-Young Lee. Young and Trethewey will read selections from the anthology at 7:15 p.m., Thursday, March 18 in the Decatur Library Auditorium at the Georgia Center for the Book, 215 Sycamore St. in Decatur. "Through elegy and throughout the years, poets have traced their own journeys through grief in order to comprehend the incomprehensible, to comfort themselves and others," Young says. "Like the book that inspired it, this exhibition traces grief's journey, from Reckoning to Regret, through Remembrance to Ritual and Recovery; if it doesn't resolve the grieving process with simple acceptance, it does end with a kind of Redemption. For while these poems chronicle loss and its rituals, elegies also celebrate life - and ask us to care for ours, if only by honoring the lives of loved ones." Elizabeth Chase, MARBL's coordinator for research services and a Ph.D. candidate in Emory's English department, is the exhibition's co-curator. "The poems put into words the emotions and experience of loss that are so difficult to express, and in a way I believe people can identify with," Chase says. "Even though the exhibit deals with loss, my hope is that visitors will experience it in a way that's reassuring. These poems convey deep sadness, but they also celebrate the complex personal bonds shared by these poets and those whom they love." The exhibition features books and unique items from MARBL's collection that feature poems reprinted in Young's anthology, along with additional highlights from the Raymond Danowski Poetry Library, MARBL's general holdings and recent acquisitions. One item not in Young's anthology is Pulitzer Prize-winner Paul Muldoon's poem "Incantata," a long poem written in memory of his ex-lover, Mary Farl Powers. The limited-edition printing contains artwork by Powers's friends, and the exhibit pairs the book with an abstract painting by Muldoon himself, taken from Muldoon's archive, which is housed at Emory. One of Young's notebooks with a draft of his poem "Bereavement," written in memory of his father, will be displayed alongside a wall panel of its printing last summer in The New Yorker. Also on display is a letter, recently acquired by Young, written by poet John Berryman to Vernon Watkins about the death of his friend and poet Dylan Thomas. Apart from hospital personnel, Berryman was the only person in the room when Thomas died in 1953. He never spoke publicly of Thomas's death, and his letter has never been published in full; this will be its first appearance in a public exhibition, and provides a remarkable firsthand account of not just Thomas's passing but the process of grief. The exhibition, which runs until Dec. 28, 2010, is free and open to the public during normal MARBL hours, which are Monday through Saturday from 9 a.m. to 5:30 p.m. MARBL is located on the 10th floor of the Woodruff Library on the Emory University campus, 540 Asbury Circle, Atlanta, GA 30322. For more information, call 404.727.6887, e-mail MARBL or visit MARBL News and Events.